Legal trials always involve conflict, whether it's a prosecutor arguing with an accused over who punched first or two people fighting about money. In most cases, the people who decide the facts of a case are the members of the jury, each of whom is called a traverse juror. The jury is sworn to make impartial decisions about the case to determine if the defendant is guilty or innocent. A traverse juror is a member of the jury that listens to the evidence both sides present in a trial and determines the facts. Before serving, the members of a traverse jury swear to the court that they will be impartial and make their decisions solely on the basis of the evidence presented in the case by both sides. If you receive a summons in the mail for jury duty, you are being asked to join the pool of citizens available for traverse jury selection. A traverse juror is a member of the jury that listens to the evidence both sides present in a trial and determines the facts. 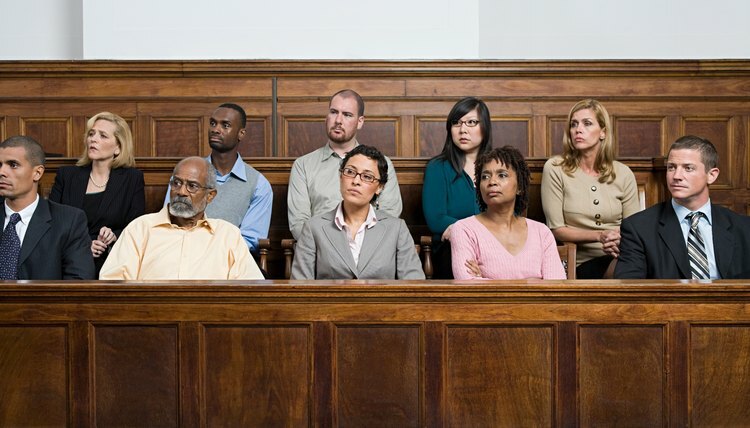 The term "jury" comes from the French word juré, meaning "sworn." Before serving, the members of a traverse jury swear to the court that they will be impartial and make their decisions solely on the basis of the evidence presented in the case by both sides. A traverse jury is sometimes called a petit jury to distinguish it from a grand jury. A petit jury often includes between 6 and 12 jurors selected to hear one case; a grand jury is a larger group selected to serve for a set period of time and hear many cases. Grand juries weigh evidence before a criminal trial, not during the trial. Their job is to determine, in each case, whether the government has sufficient evidence to believe that a particular person committed a crime. When a grand jury decides that there is sufficient evidence, the person is charged with the criminal offense. As the triers of fact, traverse jurors play a central role in the U.S. legal system. The impartiality of jurors is critical, as this allows each juror to weigh the evidence fairly and come to a decision based solely on the evidence presented. Most rules that restrict jurors are intended to help them accomplish that end. Jurors may not read or listen to news stories about the case they are hearing. They cannot investigate on their own or obtain any facts outside those presented in court. The trial judge instructs the jurors about the law, and jurors must follow those instructions whether they agree or not. Initially, jury seats are filled by members of the jury pool chosen at random. But before the jury is sworn, the judge and the attorneys ask potential jurors questions to identify anyone who has an interest in the case outcome or for other reasons cannot be impartial. This procedure is called voir dire. For instance, in a criminal case, the defense lawyer might ask whether any potential jurors are married to police officers, while the prosecutor may seek to exclude anyone convicted of a similar crime. Habersham County Georgia: What Is a Jury? Spengler, Teo. "What is a Traverse Juror?" , https://legalbeagle.com/7280422-traverse-juror.html. 12 December 2018. What is a Trial Court?